Austrian photographer Gisela Erlacher, who also studied cinematography in Vienna, is fascinated by hybrid, improvised urban situations. With public space being under increasing pressure in today’s world of global acceleration and urbanization, spaces we are unconscious of edge ever more into focus. 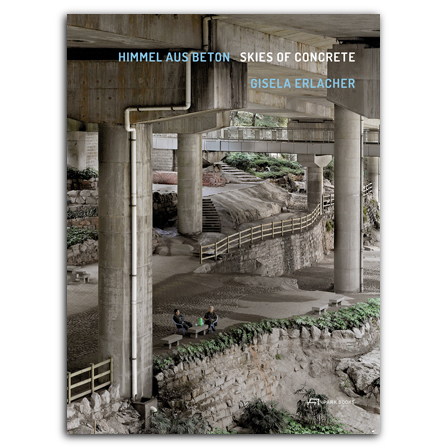 In her project Skies of Concrete she shows spaces and spatial situations that result from the construction of bridges or from the appropriation of spaces under them. Erlacher has photographed such non-spaces in China, Great Britain, Netherlands, and Austria. They are characterized by being situated under a structure and by the stunning spatial configurations resulting from this. This new book presents for the first time a selection of Erlacher’s striking photographs that allow multiple levels of reading. The essays by Lilli Lička and Peter Lodermeyer speak eloquently about her work and the spaces her images capture. is a landscape architect and founding partner of koselička Landscape Architecture in Vienna since 1992. She also teaches as a Professor of Landscape Architecture at the University of Natural Resources and Life Sciences in Vienna. is a scholar of art history. He lives and works as a critic, freelance writer and curator in Bonn.